Sunday October 24th 1881 It rained all day. I helped with the work, read a little and played on the piano. Monday October 25th 1881 It had not cleared of entirely this forenoon. I worked till eleven oclock giving the upper story a good cleaning out. Bridget washed in the afternoon and I was busy about the house most of the afternoon. Tuesday October 26th 1881 I took May over and started her into school this morning. I was at Hatts a little time. I came up town and got stuff for a dozen napkins and a couple of night shirts for Charlie. I sewed all the afternoon and evening. 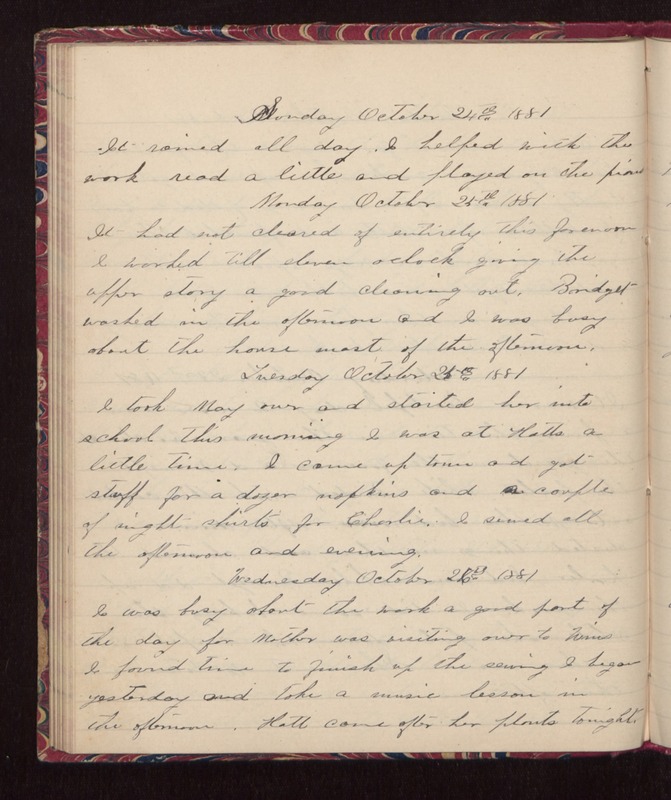 Wednesday October 27th 1881 I was busy about the work a good part of the day for Mother was visiting over to Wins. I found time to finish up the sewing I began yesterday and take a music lesson in the afternoon. Hatt came after her plants tonight.